My work has byproducts that go to waste if I don’t collect, organize and archive them. This newsletter is how I ensure I never forget about all the things I’ve learned along the way. Swipe File is essentially a weekly journal of the lessons I’ve learned for the last two years. It’s a database of verified ideas that I pull from often. It ensures that everything I read and love is put on a shelf to be referenced later. This is more of a letter to myself than an article, but I think you might find some inspiration for your own career. Enjoy. Ideas are so often fleeting. Some could be great, but we usually don't give them room to develop. Writer Jocelyn K. Glei (also quoted above) has a simple system that gives her ideas room to breath. Little processes like this seem trivial, but it decreases the cognitive stress of trying to remember too many things, which frees you up to focus on what's important. It's a force multiplier. This is the real beauty of using Evernote or a similar system: You can see your ideas ripening. By capturing down every idea in one place and then giving yourself time and space to build on that idea (as you constantly add in new notes, thoughts, and links), it becomes significantly easier to see which ideas might become real projects you’ll want to pursue, and which are just one-off ideas that don’t have longevity. Using a simple, digital system like Evernote also helps you see the relationships between ideas more clearly than you can when just paging through a physical notebook, where it’s easy for ideas to get scattered and disjointed. 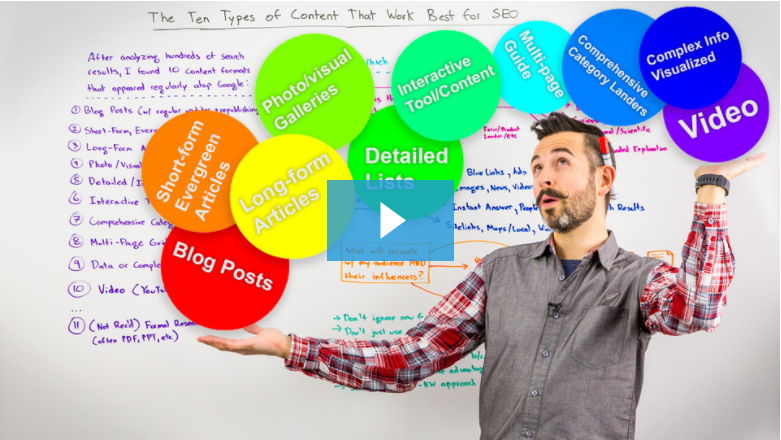 Rand Fishkin has been doing Whiteboard Friday for so long that it's easy to forget how great it is. So here's a reminder—this is really useful for people working in content marketing. Devesh Khanal: "Stop writing blog intros like a high school research paper." Wistia: "People spent on average 2.6x more time on pages with video than without."